The Itty Bitty Kitty Committee: Tea with The Bean!! Alison and Eleanor, who flew ALL the way from Virginia to join us, arrived at 11:00 AM with a bouquet of flowers for me, and a half dozen sparkle balls for Bean! Thanks, ladies!! Charlene was napping on the couch when they arrived, and woke up to say hello. While we were distracted by the Furmans, Charlene slipped into the room to score a few kitten crunchies. Because this was a special day, I pretended not to notice. But Curtis took note, and went over to protect his bowl. After enjoying the kittens for a bit, it was time to eat. On the menu - a lemony orzo salad, fruit salad, and tiny tea sandwiches, of course! 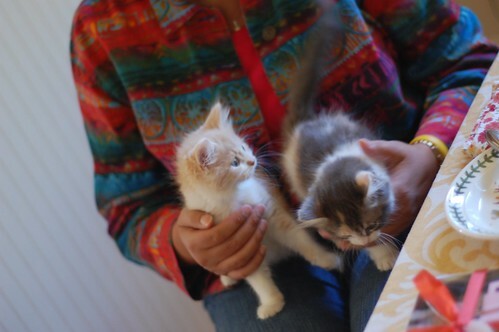 While we ate, the kittens (mostly Teddy) attempted to join us by climbing our legs and the table cloth too. 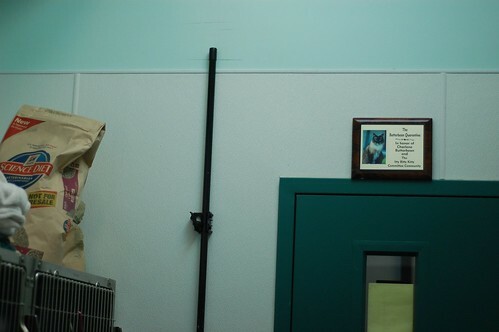 When we were through lunching, we headed over to the Humane Society for a VIP tour. Marguerite, Development Directer, was our guide. 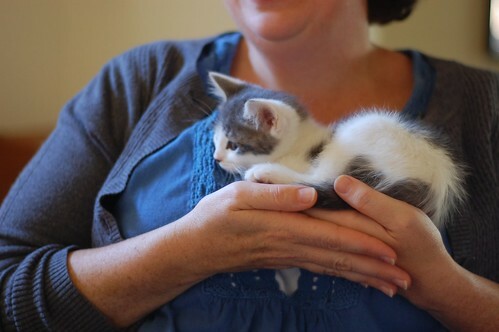 First stop was the lobby, where we met the adoptable cats, then on to the Foster Room, to meet all the kittens! We went through Vet Treatment next. Dr Robbins and Vet Assistant, Lori, were examining a litter of wee ones. Alison has a weakness for orange kitties, and this charming fellow in Butterbean Quarantine was doing his best to tug on her heart strings. 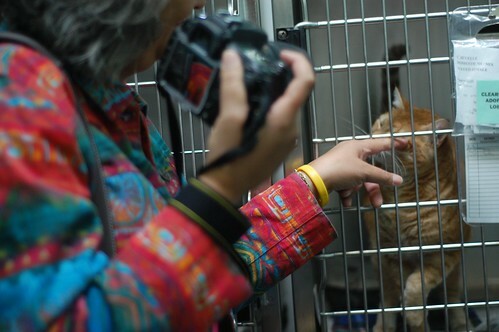 Last stop was The Cattery, which houses the stray cats waiting to be reunited with their owners. The tour was fun and informative, and we all enjoyed the red-carpet treatment that everyone gave us. 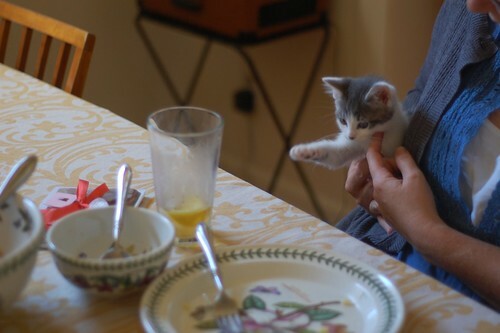 Afterwards, we headed home to spend a little more time with Bean and the kittens and eat desert. 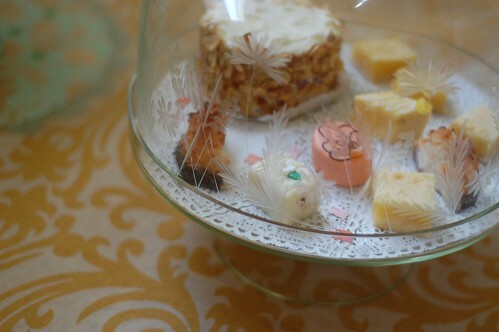 We had a selection of sweets from a local bakery. 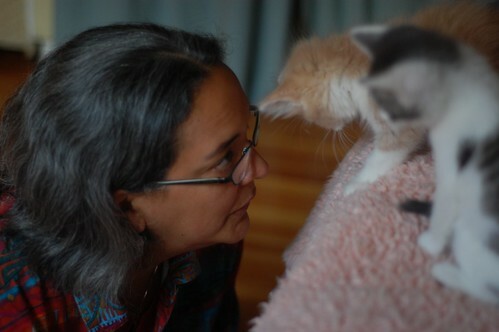 The kittens were equally sweet. While Alison and Eleanor enjoyed the babies, I broke out the sparkle balls, tossed them to Charlene, and she performed leaps for them in the living room. After a lovely afternoon, we all said our goodbyes. 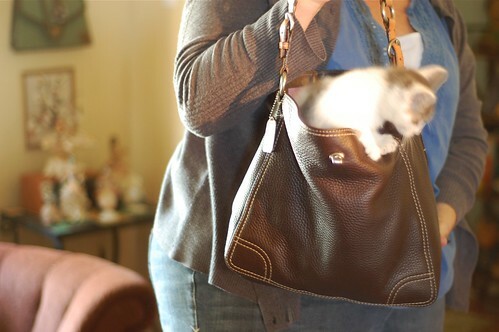 Somehow Teddy "accidentally" found his way into Eleanor's purse. It really was a great day and I think all felines and humans had a good time. Thanks so much for flying all the way across the country to lunch with us, Alison and Eleanor! And thank you, of course, for your generous bids! (Alison was the winning bidder on the tea, and Eleanor, the winning bidder who named little Betty June Suprenant) I'm so glad you got to come visit the shelter and see how your donations were put to use! It was so nice meeting you both and I hope one day our paths will cross again! What a treat for them! And what generous hostesses/hosts you all were! 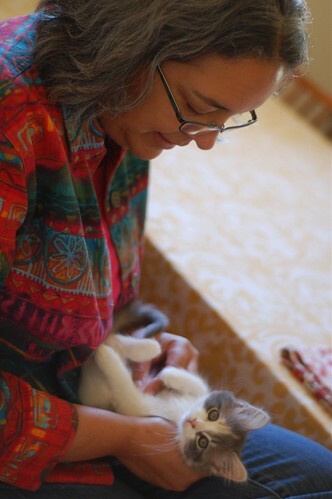 Laurie, you and the kitties and the Humane Society folks made it such a special day for these lovely donors! Thanks for letting us join in! I only regret not being able to see the Bean jump around for those sparkle balls!! oh looks like a wonderful time was had by all! I thought I was jealous (well, maybe a teeny bit!) but I'm really glad to see Alison and Eleanor enjoying this lovely day :) Thanks for sharing this with us! and lol at Eleanor and Teddy!! that was so wonderful to e-experience! thanks all. 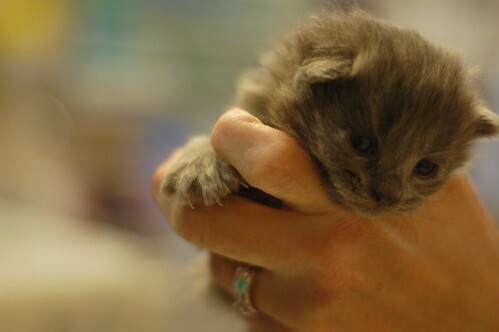 A confession...up until right now I wasn't jealous of Alison & Eleanor, just delighted for them.....and I saw these photos and description of the tea, HS shelter visit, and the opportunity to actually see Butterbean in action, touch the Furman babies, and meet you, Laurie! What a wonderful day for all! Laurie you know how to do things right that is for sure!! Looks like (unsurprisingly) a wonderful time was had by all. :) Not-so-tiny twinge of envy aside, it was great to get the run-down of the visit and see you all so happy. Is it just me, or given his attempts to join the table and settling himself in Eleanor's purse doesn't Teddy seem to be the most determined of the kittens in a quiet I'll-do-what-I-want way? Wow, looks like everyone had a fantastic time. By the way, could you share the recipe for the orzo salad? Here's the orzo recipe. It's SUPER easy and flavorful. 1. Cook orzo according to package directions, omitting salt and fat. Drain and rinse with cold water, drain and place in large bowl. It looks like Teddy was pretty determined to claim Eleanor as his own! Congratulations to all of you, and thank you for letting us all share the excitement! Wow, that look little Edie has... How could you resist tucking her in you bag on the way home??? Must try that orzo salad recipe! Thank you for showing us around...it was wonderful and inspiring! Teddy was quite smart and ahead of the game, selling his cuteness. Oliver was also trying his best to be offbeat in the 2nd shot. I love his posture in that pic - was he really sitting ON his bro? What a character! Thanks for sharing this special event! HEE HEE HEE - I have the SAME portmeirion dinner service! 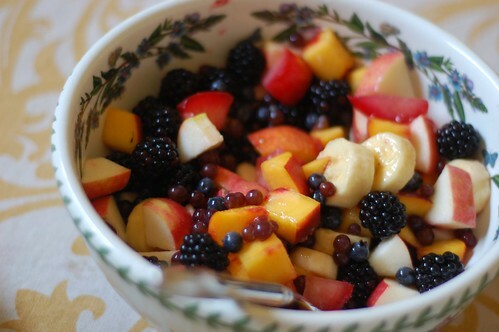 Doesn't the fruit salad look great! Who is that charmer upside down in Alison's lap? What a flower face! P.S. I made the salad tonight because I had everything on had except the goat cheese, for which I sent BF to Murray's (just 2 blocks honey!) It's one of the sticky days in NYC and I was trying to come up with something light and refreshing. It's terrific! Wow, looks like everyone had a great time! And the food looks so delicious! Awww, Baby Edith got a sweet snuggle - thank you, Alison! 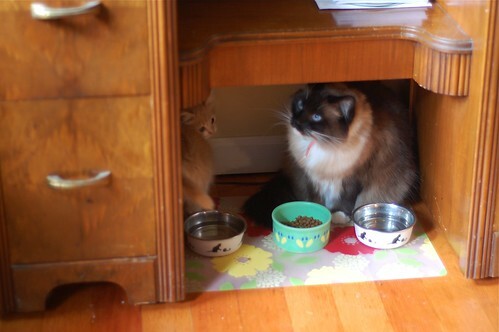 And how brave of Baby Curtis to defend the kitten crunchies! That fruit salad looks so good I could attack my computer screen with a spoon. Wow, looks like a really fantastic day!! 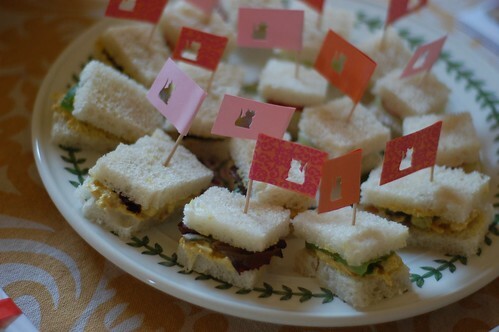 I forgot to say that I really love the kitty "flags" on the tiny tea sandwiches! This is just TOO wonderful!!! The whole idea, Tea with The Bean (and Laurie! ), is such a winner, and then those precious Furmans, the scrumptious menu, VIP tour and a stowaway Teddy. 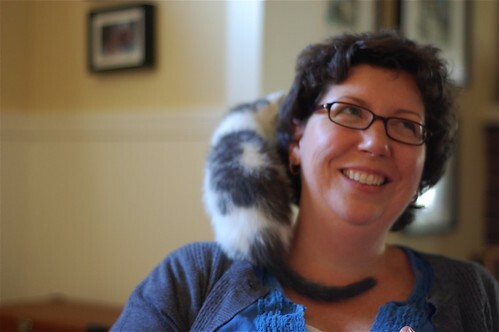 There's no way I can choose a favorite photo, but my top contenders are Curtis and CrunchieBean in the feeding nook, Alison with the topsy turvy baby in her lap, the happy look on Eleanor's face as she's wearing a kitten wrapped around her neck, and of course, stowaway Teddy. 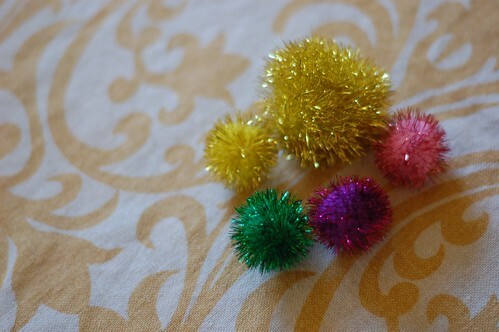 Sparkle balls for all! What a sweet post! So proud that it was women from Virginia who made such a difference and had such a treat. It must have been extra wonderful to be in THAT climate and miss a few few days of Virginia heat and humidity. Yay Alison and Eleanor! 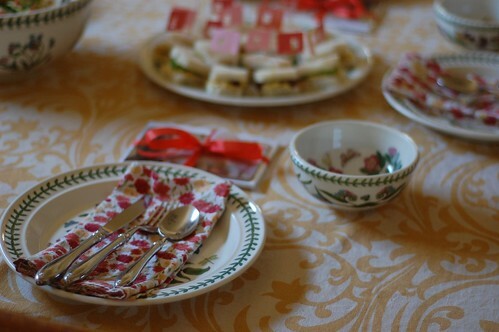 Just wanted to say the photos were lovely and that I particularly liked the little kitten flags on the tea sandwiches, a very nice touch. Yep...the sandwiches are almost as cute as the kittens...Food, Floof, and Fun! A winning combination. Thanks for the pics...and letting us live vicariously. Thanks for the recipe. I made it today and it is yummy and so easy. so sweet. you are an artist indeed. Thanks, Laurie, Alison and Eleanor for making this virtual luncheon possible for the rest of us. :) I really enjoyed it! What a fantastic post! Sounds like a great day was had by all humans and kitties! What a wonderful host you are, Laurie! Those tea sandwiches alone must have taken forever. Wot a lovely post! And as nice as the beans are, the kitties were the stars of the show! It looks a bit like sweet little Curtis might have intended to protect his food from Charlene, but changed his mind once he got up close! Ah, Laurie - thank you for these pictures! Ladies, I'm so tickled for you; you were representing us all and for my part, the seeing was second ONLY to having gone myself. What sweetness you provide, Laurie. Wow what a great thing to do! I am jealous but am so glad that Virginia and Allison had the opportunity to see how their donations were put to use. Nice that they brought sparkle balls for Miss Bean and flowers for you Laurie. 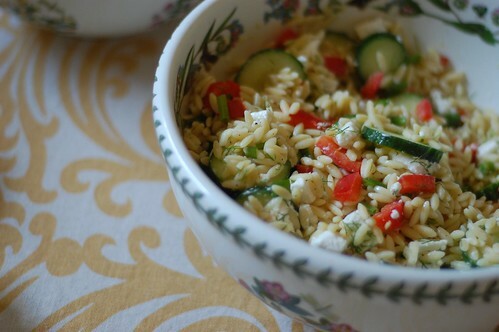 Love all the photos and maybe I just might try to make that orzo salad as it sounds just delicious! Yummy lunch too! If given the opportunity, I would rate this post as one of my top 10 favorite IBKC post of all time! Its just off the charts fantastic! Question: am I the only one who wishes that Alison and Eleanor would each post a little something here to share their day with us in their own words? That would be so awesome! Laurie, your idea to host a "Tea with the Bean" was absolute genius and inspired! Dear Laurie, thank you so much for this fantastic post...I felt so special as I was allowed to live vicariously with Alison and Eleanor as they enjoyed their "Tea with the Bean". And in closing, thank you so much for all that you give and do to care for these precious, innocent creatures who have nowhere else to go...Thank you!